Today’s babe hustles hard in a fast-paced world that never sleeps — and one we know all too well — as the senior digital marketing manager for the one and only Shake Shack. Her role has grown alongside the company’s expansion, and she’s responsible for everything from social media and public relations to the occasional stint in hand modeling. In addition to her main focus at the Shack, Roxanne takes on freelance gigs to further expand her knowledge and stay on top of digital trends. Thanks so much for sharing your story with us, Roxanne! Very first job: Unofficially, probably somewhat of an intern at my parents’ old recruiting firm. Officially, an internship at Rutgers at the Office of Development for the School of Engineering. I have so many it’s hard to choose! Diane von Furstenberg is top-of-mind because I just started reading her book, “The Woman I Wanted to Be.” Not only did she create a fashion empire and the classic wrap dress, but she focuses much of her energy on mentoring and empowering young women. I recently saw Diane speak on a panel about how “having it all” looks different for every woman. She said: “The most important relationship in your life is the relationship you have with yourself. Every relationship you have is a plus, not a must.” I’m a firm believer in loving yourself before you’re able to be in a meaningful relationship with someone else. I love all things music so you can usually catch me at a concert or a Sofar Sounds show. My boyfriend and I also love to explore different parts of Brooklyn and the city, discover new food, coffee spots and awesome shops (Regular Visitors is one we stumbled upon last weekend!) Other days, I’m perfectly content chilling on our couch and binge-watching something (I’m working on The Crown right now, but Friends is always a winner). Whatever my boyfriend/personal barista is homebrewing, or iced coffee, or cold brew with almond, or oat milk (non-dairy is the way to go). Gin and tonic! But sometimes I keep that on the DL because of this article. I’d love to learn more about photography and what (technically) goes into capturing the perfect shot. The New Yorker, and I read The New York Times morning roundup every day on my commute to work. I also read Adweek and TechCrunch for industry updates. No #fakenews here. I need to brace myself for the judgment here... bunnylovr726. I have five tattoos! They’re all on my arms, but sometimes they get hidden by my shirts or sweaters. As the senior digital marketing manager at Shake Shack, I manage and oversee our social media strategy (follow us at @shakeshack), various digital initiatives like delivery, web ordering and the Shack App and content creation (my hands are famous for holding burgers). We have a global audience of over 1.5 million fans, so I work closely across different teams to make sure we’re responding to guests and entertaining our fans with creative content, all while staying true to our brand and strategy. As cheesy as it sounds, it’s hard to pinpoint what a “typical workday” looks like because every day is different. First thing in the morning, I usually refresh our feeds and respond to all guest tweets, comments, etc. that might have come in overnight. Some days I’ll spend hours diving into campaign performance reports and tying them back to menu sales numbers. Other days I’ll be at a photoshoot for social content getting my hands dirty (literally and figuratively). What inspired you to pursue a career in digital marketing? I’m obsessed with digital marketing because it marries creativity and analytics, which is me in a nutshell. I love how digital marketing can be so subtle; my boyfriend will mention how he saw an ad on his Instagram feed for a promo code to a store we visit often, and I geek out over the beauty of geotargeting. That sounds incredibly nerdy, but I enjoy getting campaign inspiration, learning what mistakes to avoid and guessing brands’ digital style guides just by studying their presence on various digital channels. 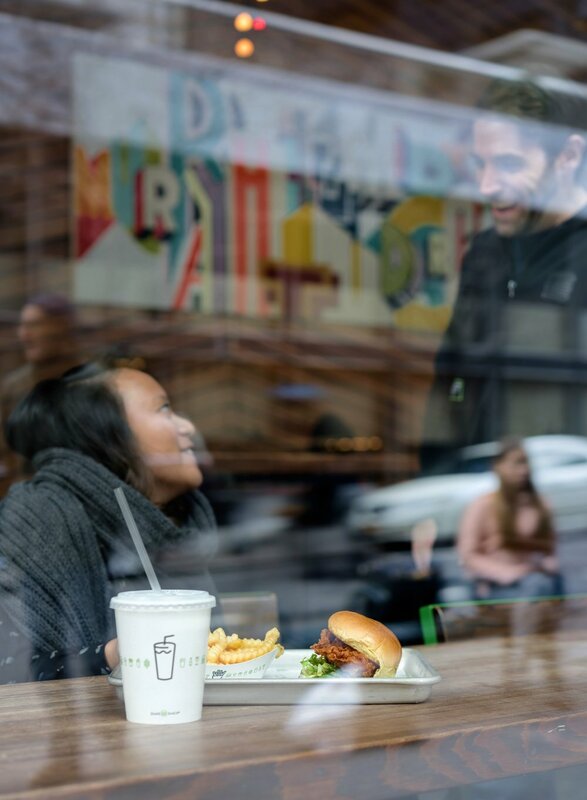 When and how did you first get involved with Shake Shack? I started with Shake Shack when we had just around 40 Shacks globally. Two and a half years later, we have almost 200 Shacks worldwide. I’ve been so grateful to witness how this awesome brand, built on Danny Meyer’s enlightened hospitality philosophy, has evolved over the years. I started at Shake Shack fresh out of college in the most junior role on our marketing team doing a mix of admin, PR, guest experience and digital marketing work. It was a great role to start in because it let me experience all the different fields of marketing and communications while I was still deciding what exactly I want to specialize in. About halfway into the role, I knew I wanted to dive in deeper into the world of digital marketing. As digital marketing manager, I focused on our organic and paid media strategy and launching our first-ever mobile ordering app. After a year and a half, I got promoted to senior digital marketing manager, where I’m able to focus on more high-level strategy. Now, I’ll be managing a brand-new team of three to take Shake Shack’s digital marketing efforts to new levels. What has most contributed to your growth within the company? I attribute my growth within the company to an even mix of luck and a willingness to get sh*t done. I was hungry and eager when I first started at the company, and I still have that same enthusiasm today. I maintain a no-task-is-ever-too-small mentality and take pride in whatever I’m doing, from admin work to big-picture strategy. I’m thankful to be at a company like Shake Shack, where my thoughts, opinions and ideas are heard and welcomed. One of my favorite parts about working here, besides the people and company culture, is that if you have an idea that makes sense for the brand and you can make it work logistically, you’re encouraged to take it and run with it. What did your hustle look like before Shake Shack? Before Shake Shack, I was juggling college and internships. I would go back-and-forth from New Jersey to New York City switching roles from student to intern. I worked incredibly hard in college to graduate in three years, and while I was a student I led all marketing efforts for the Rutgers University Programming Association (RUPA), an organization that planned the university’s major events, including concerts, comedy shows and guest speakers. I’m also so grateful to have worked with awesome companies, like Complex Media, Viacom, Amazon and Spotify. When did you start implementing freelance work into your schedule? I started doing freelance on the side almost immediately after graduating from college. I see freelance as a chance to learn more about your profession across different industries. From time to time, I’ll consult on different brands’ social media strategies. It’s always an adventure and a new challenge doing strategy for brands outside of the food and hospitality industry. One freelance project I’m thankful to be a part of is Project Picture Day, a nonprofit organization that fosters emotional development of students through organized school picture days. My old intern supervisor at Complex, Jules, founded the organization. It changes almost every month. Right now, I’m most proud of the opportunity to build and lead my own team. As I’ve progressed through my career, I’ve kept track of what I admire in a leader, and I’m extremely excited and thankful for the chance to put some of these qualities into action. Many people think my job is easy since everyone has social these days and taking photos always looks fun, but it’s a lot of strategy and numbers. While it is a super-fun job, there’s a ton of hard work that goes into it. Photoshoots, for example, take weeks of planning and concepting. Our call times are usually at 7 a.m. or 7:30 a.m., and we either go until around 1 p.m. or rock it out for a full day ending at 6 p.m. At the shoot itself, it’s awesome seeing our concepts come to life, but you’re also on your feet all day and constantly moving, setting up the next shot, tweaking the current one, etc. I think people tend to forget the work that goes behind a brand’s presence in the digital sphere. It’s a lot of analyzing data, using it to inform strategy and doing it all over again because digital changes so often. I’m about to blow my own spot up right now as a fangirl, but I love what Elisa Benson, who previously led digital projects at Hearst, Fadia Kader, who does music partnerships at Instagram, and Gena Kaufman, who is director of social at Vogue, are doing. Work hard and be nice to people! Network as much as you can, stay on top of industry trends and keep an eye out for brands that are killin’ it on digital. Digital changes almost every week, so it’s important to stay up-to-date and be flexible and able to adapt quickly, all while maintaining a good attitude. Everyone in the digital marketing world are true hustlers because it never sleeps. What is your philosophy on work/life balance? Having personal time is super important to me. In some companies, they renamed the social/digital team to the “always on” team because it’s the nature of our roles. Even so, I still carve out time in my day and weekends to stay away from email and take a moment to relax and be present. This is one of the everyday struggles of being in digital, and it’s something I continue to work on. While Shake Shack is a huge global brand, we still have a fairly small team and a startup mentality. At photoshoots, I’ll help produce, art direct and model. Because our team is lean (but mighty! ), I’ll hop in from time-to-time to pose as a glorified hand model. I had this bracelet I would always wear that was plain black with a fastener that looked like a belt buckle. It was on my wrist for a few shots, so a couple people on social decided to call it out and say the “hand model needed new jewelry.” I haven’t worn the bracelet since! It’s also always an interesting experience when you walk by or into a Shack and see your body/hands/etc. in a photo! My momma always said, “We rise by lifting others.” In a competitive industry, it’s easy to get caught up in your own career, but it’s important to support and help others—from friends to coworkers to strangers. I’m also a firm believer that “you don’t get what you don’t ask for.” I’ve learned to apply that belief to both my personal and professional lives. Always ask to be included in that meeting you want to attend, always ask if there are any more discounts available, always ask if you can have extra guac, always ask for the raise or promotion you want.